Maco PKG is a well-known manufacturer of extensive ranges of superior quality barrier bags for multiple industries. These bags are widely demanded for safety purposes due to their ability to protect content from external damaging elements. Barrier bags shield your product from moisture, gases, chemicals, liquids, grease, and light. Although these bags perfectly suit many purposes, industries prefer them most for their dependability and practicality. The food industry in particular takes advantage of their protective qualities in order to maintain the strict regulations associated with being Kosher and Organic certified. These bags ensure the contents remain fresh for extended periods of time. Our barrier bags service more than merely the food industry. They’re used for insecticides and other farming products that have chemically based components. When necessary, we submit our barrier bags to a vacuum to remove odors emanating from the product. We manufacture our barrier bags with a laminate of multiple layers of aluminized foil and metalized films such as nylon. Metal layers provide shielding and minimize the penetration of electricity like static. Because of these metal layers, our barrier bags protect sensitive objects, such as electronic instruments, from contaminants, dust, and other impurities. We provide barrier bags in various customized sizes for all needs. Tell us what is your overall intended purpose for barrier bags and we ensure our packaging meets all your standards. 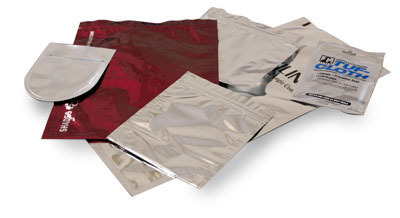 In addition, Maco PKG’s barrier bags align with all official government regulations. Maco PKG’s barrier bags protect your product, even fragile or sensitive items, from various external damages. We manufacture them in a wide variety of sizes and styles, but always with a professional design. They’re reusable and user friendly so purchasers can easily participate.